In lieu of the holiday, we will not be having MidWeek Worship tomorrow evening. Enjoy the holiday with your family and friends. But be sure to join us next Wednesday at 6:30 PM for our Solemn Assembly - a very special time of reverent prayer before our great God! You don't want to miss it! Office Closed on Thursday, July 4th! Just a reminder! 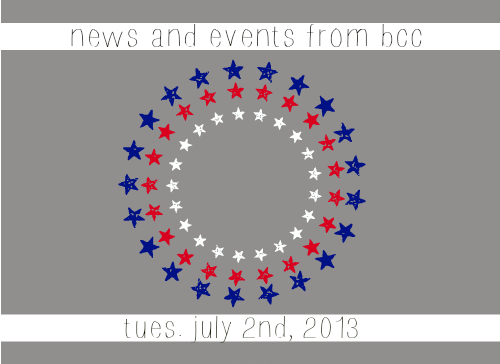 The office will be closed on Thursday in celebration of Independence Day! Have a blessed day! Calling all Green Thumbs! We need your help! Join us on Friday, July 5th at 5:00 PM for harvesting and Saturday morning, July 6th at 9:00 AM for community distribution! We are already harvesting zucchini and yellow squash every couple of days. If you know anyone who could use these, let us know! We'll see you at the garden! Men's Breakfast This Saturday, July 6th! Attention men! Join us for a time of food and fellowship this Saturday! See you at the Student Center at 7:30 AM!